To give my conclusion first: The Pit-Prop Syndicate is not a success. Freeman Wills Crofts’ publishers would disagree, and it seems they have disagreed with me repeatedly, for although this book – Crofts’ third – was first published in 1922, and since it has reprinted many times in paperback, and it was even issued as part of a hardback Crofts Collected Edition as late as 1970. For a book in which the protagonists spend a lot of time watching a barge being loaded in the first part of the book (hidden in an empty drum) and then watching a barge being unloaded in the second part, is in itself curious. What is perhaps more interesting is the development of the story from earlier books. Two holiday-makers in the pine forests near Bordeaux become suspicious of a lorry transporting pit props to a docks as the story opens. They investigate and discover among the loading crew an English man and his daughter. She becomes the love interest, piquing their curiosity. Although one of the holiday-makers works for the British Customs and Excise he makes no formal attempt to involve his department. This opening is not original, it copies Erskine Childers’ Riddle of the Sands (1903), but that involved an invasion fleet aimed at England, not one boat steaming from Bordeaux to Hull and back. Excitement levels seem to have dropped considerably in the twenty years between the two titles. In the second part of the book the English man is found shot in a London taxi and his daughter disappears. The police become involved and now spend as much time at the other end of the pit props’ journey – another dockyard, this time on the Humber. At this point, despite the involvement of both the Excise and the police, no criminal activity has been assigned to the pit prop trade, and no one has been identified with an interest in shooting anyone. Hero Merriman and Inspector Wilde, though, are intent on finding something. Let’s be frank when talking about France. There was not going to be a White Slave Trade transporting virgins from Bordeaux to Hull – in fact, not to any port on the Humber. So there could be only one other crime to be considered: smuggling, and smuggling was going to be either perfumes or alcohol; with the French connection that alcohol would be brandy. Apart from the murder, and that seems to be a minor feature of Crofts’ tale, this is a ‘caper’ story. 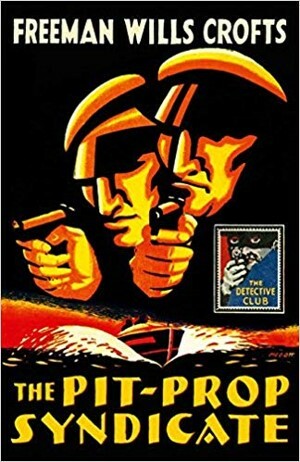 The plot is the sort of thing that Donald Westlake would later make his own, but Crofts – who has difficulty making us feel Merriman’s love for the girl – making cyphers of the smugglers. Just as they are often seen at a distance by observers, so his descriptions make them indistinct. Furthermore, as the folk song put it, “Said the captain to the crew ‘We have ‘scaped the Revenue’”: it is difficult to sympathise with Customs who calculate how much they might be losing through brandy smuggling when it is clear that until Merriman began snooping there was no murder or violence at all. Crofts was going to have difficulty changing that attitude. There then comes the question of where the smuggled brandy was being disposed of: not many parsons opened their back doors at night to receive illicit brandy in the 1920s, nor does it appear to have made itself popular in the general licensed trade of Humberside, for when Inspector Wilde buys a round of spirits, he buys whiskey, not brandy, so the availability of cheaper (untaxed) spirits was no advantage. What was the benefit if no consumers made a market? As Crofts’ writing developed, he found better motives – human passions before the physical world. One of his later titles depends on the calculation of the rate at which a railway embankment was constructed to identify how far back a buried body would be found (the same principle that police must recently have applied in the search for Corey McKeague in Bury St Edmunds), which combines death and mathematics in an exciting way, and one of his novels set in World War Two, based on company limited liability law, achieves again the tension that drives all good crime novels. This new edition in Collins’ Detective Crime Club series comes with an introduction by John Curran and an additional short story, "Danger in Shroude Valley". Those items increase the value of the volume, but The Pit-Prop Syndicate, where it is difficult to identify with the protagonists, where one has a feeling that the wrong side has won, and which has abandoned the wide vistas of a Riddle of the Sands, is not one of Crofts’ successes.